This project began as the basis for a class that I took in spring Term 2015 called “Français des Professions.” The class consisted of seven students of French, including myself and our teacher, Stéphanie Roulon. Although this project was at the base, the activities that we did in class served to help us with the project as well. We read about cultural differences between France and the United States and had discussions about our readings. ​We also learned how to write professional emails in French and got a chance to use our skills writing to organizations and people in Portland and France in French (and sometimes English) who we thought might be interested in our project. We also learned the basics of making a professional phone call in French and leaving a voicemail, and we each got a chance to choose a current event in France and share it with the class and lead a discussion. As far as the sister city project itself, we began by finding French cities that were not already paired with a city in the United States. The first three cities we found were: Annecy (in the Rhône-Alpes region), Saint-Brieuc and Saint-Malo (Both in Bretagne). We began to do research on these cities in small groups and search for contacts. We also worked together to think about what things each of these cities had in common with Portland and what aspects of Portland would we want to share with a French city. To get more input on this, we created a survey that asked people if they would be interested in having a relationship like this and if so, what kinds of things would they like to see come of it, and what they appreciated about Portland. We got a lot of responses! 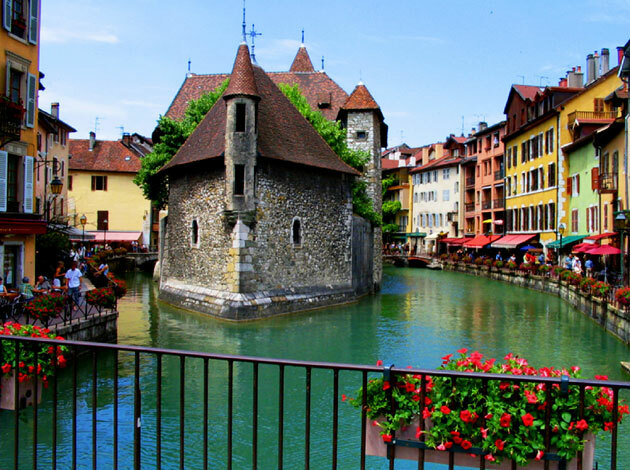 By the end of the term, we had decided to go with Annecy as our chosen city, and had just started to look for contacts there. Then, over the summer and into winter, the project was paused. I met with my teacher last year and I was looking for a way to have my Capstone incorporate French, because that is my major. We discussed the possibility of me working on this project as part of my Capstone, and then we found this class, and it fit really well with this project. This project was re-started this year in part because I wanted to continue to work on it for this Capstone, but also because there were other students from the class last year who were interested in working on it as well as our teacher. This project is in the beginning stages, but I hope to continue being involved in it as it evolves and takes shape into something amazing! Building community between two countries and two cities. To me, this means connecting people and groups together in ways that allow us to learn from one another, to feel like we are part of a community together, even if we are in separate countries. Cultural exchange (this can take many forms). Cultural exchange can be thought of as both a result of a relationship such as this as well as a goal for what needs to be established. I say this because anything we do to work on this project is, in a sense, cultural exchange. Cultural exchange can also be more specific, such as exchanges between schools, businesses, or even individuals. A project such as this has the potential to affect change on an individual level and a broader level. This project will hopefully accomplish both of these things. And although groups and communities are a focus, the individual is also important. When I met with my teacher after deciding that this Capstone would be a good fit, she suggested that my focus for the project be connecting schools in the two cities. That was one of the main things that I did, but I did other things as well. Because this project is in the beginning stages, and rather broad and fluid at this point, we are having to adapt to it as we go along and see what needs to be done. Helping to coordinate a meeting for me, the other interested students and our teacher. Contacting two people in Saint-Brieuc who expressed interest. Doing some research on the potential cities in France. 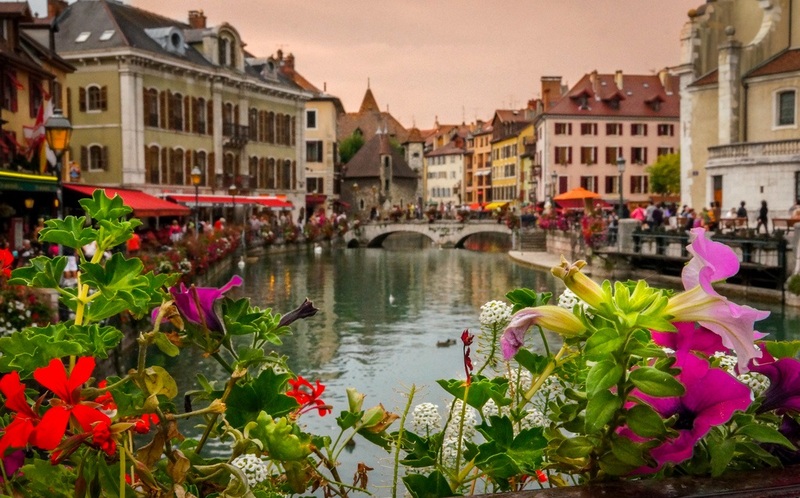 Finding contacts for schools in France in the possible cities (especially Annecy). Contacting the committee in Annecy responsible for sister city relations. Communicating with my teacher and the other students. A picture of Lake Annecy! This is from the internet, soon I will have my own pictures to share! Although Portland has established other sister city relationships, we do not have one established with France, which was surprising. A relationship between a French city and Portland has many benefits. I would say that this project as a whole is an unmet need, because we are missing a relationship with a country that is known for many things, and there is so much that a French city has to offer Portland and that Portland has to offer as well. 1) Choose French cities to contact that are not already connected with a city in the United States. Establish connections with the cities and see which city seems most interested in being connected with Portland. 2) Contact schools in the chosen potential French cities, explaining our motivation for the project, and find out if they would be interested in connecting with a school in Portland. 3) Contact schools in Portland, explaining our motivation for the project, and find out if they would be interested in connecting with a school in France. 4) Establish a relationship between at least one school in Portland and one school in France, and begin working on what forms that relationship could take. ​5) Personal goal: Find a way to connect my upcoming trip to France this summer with this project! Although all of these goals have an individual importance, I believe that they are all related to one another and that for these goals to be really effective, they rely on each other. For example, effective communication is an important aspect of critical thinking, being able to appreciate diversity and being socially responsible. Effective Communication: to collaborate effectively with others and to be competent in appropriate communication technologies (verbal, non-verbal, listening, ect.). Communicating with my teacher and the other interested students in French so that they know what I am doing, and responding to the emails from my teacher and the other students. Communicating with schools in France in French, and presenting myself and our project in a professional manner in my second language. Being aware of cultural differences that could affect communication (response time for emails between the two countries, and differences in conversation styles, for example). Critical Thinking : problem posing, investigating, conceptualizing...in order to become active, self-motivated and empowered learners. The above goals require me to use Critical Thinking skills because I have had to think about not just my own thoughts and the input that I have received from my own culture about how things are, but to be aware that I am communicating with people who are coming from a different culture and who I have never met in general. In reading about the different potential cities for the sister city project, I have had to think and reflect about why things might be different there, such as with accessibility for example, and what are the similarities and differences between these cities and Portland. Appreciation of Diversity : appreciation for and understanding of the rich complexity of the human experience. The above goals require me to focus on the Appreciation of Diversity because one of the main reasons for doing this project is to bring to cities together to share cultures. With a cultural exchange between a city in France and Portland comes not only an exchange of French and American culture, but an exchange of all of the types of cultures in each of the cities. I am using this term in two ways here: in its classical sense but also just to refer to different subgroups of people/cultures in these cities. For example, there is a food culture in each of these cities, and there is an art culture in each of these cities, but there are also many cultures of people as well, who are brought together by some shared characteristics, whether that be nationality, language or interests to name a few. Social Responsibility : to expand and understand the impact and value of individuals and their choices on society both intellectually and socially. The above goals also reflect Social Responsibility because they are directly related to impacting people and thinking about how to make that happen. I think that this project is a sort of social responsibility on its own. In other words, we as a city and those involved in this project have a social responsibility to connect and to share perspectives. This allows people to further their capabilities with the other four goals as well. Choose French cities to contact that are not already connected with a city in the United States. Establish connections with the cities and see which city seems most interested in being connected with Portland. 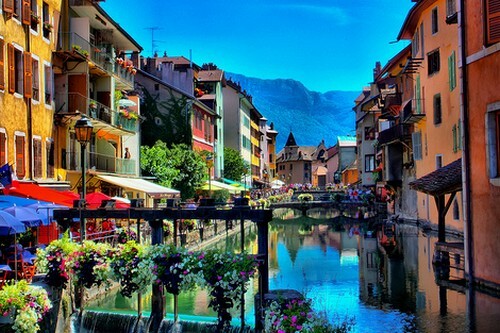 ​At the end of spring term last year, we had decided on Annecy as a city to connect with. We thought that it would be a good fit for Portland and we had just started to find contacts in that city. Then, in the winter, my teacher Stéphanie Roulon received an email from someone that she had met who works for an organization called Travel France. This person said that he remembered that Saint-Brieuc was one of the cities that we had been considering as an option, and that he knew of a couple who had lived in Portland in the 1990s and who now lived in a city near Saint-Brieuc and that they were interested in our project. In the beginning of April 2016, I met with some of the other students and our teacher to discuss how to proceed with the project. We decided to keep both Saint-Brieuc and Annecy as options since we had a new contact in Saint-Brieuc. My teacher emailed them once and got a response, but then when this project began again in April and I sent an email, there was no reply. Then another student tried to email the sister city committee in Saint-Brieuc and did not get a reply. Not having much luck with contacting people in Saint-Brieuc, that student suggested that we look for other potential cities to partner with, while still working on Annecy. He proposed two cities, Marseille and Sainte-Foy. I did some brief research on Marseille, but I continued to devote my time to beginning to contact schools in Annecy. Because we have made a connection with a school in Annecy, I think we will continue to try and establish a relationship with that city. I contacted 19 schools total in Annecy, 16 public and three private schools. I wrote a draft email that I sent to all of the public schools. I received one response back from a public school that said that they could not participate because they had other projects. Nous serions très intéressés par ce projet bien sûr ! Pourriez vous nous donner les directives à suivre? I was so excited that she responded so enthusiastically! I asked my teacher how to respond and I suggested that I tell her when I will be in Annecy. I sent the director an email saying that, yes, she could give us instructions, that we were in the process of trying to find a school in Portland, and that if she was interested, I would be in Annecy July 16-18 and could arrange to meet with her to discuss the project. I have not heard back from her yet. I did not get to this piece myself during this Capstone. My teacher said she would see if her daughter’s elementary school, Peninsula Elementary would be interested. I had started to write an email to Metropolitan Learning Center, my former school, about the project. After I received the email from Les Tilleuls, my teacher said that she would work on contacting Peninsula Elementary and Le Monde French Immersion School. ​4) Establish a relationship between at least one school in Portland and one school in France, and begin working on what forms that relationship could take. This goal was not completely met during this Capstone, but I am happy that I got a response back from a school in Annecy, and that they want to participate in this project. Even if the relationship has not yet been created, the process has started! ​5) Personal goal : Find a way to connect my upcoming trip to France this summer with this project! I have not heard back from the school Les Tilleuls yet about if I can meet with the director while I am in Annecy, but I hope to be able to meet with her or perhaps someone else, and possibly someone from the sister city committee in Annecy! I hope to make connections and learn things while I am there that I can share with the other students and our teacher when I return to Portland! MY UPCOMING TRIP TO FRANCE! I had mentioned earlier that a personal goal of mine was to find a connection between this project and a trip to France that I will be taking this summer. I will be going to France this summer with my younger brother for three weeks, from June 28th to July 20th. I have been studying French for almost 10 years now, and I have wanted to travel to France for most of that time. As I have continued to study French, that desire has only grown stronger. Last year I was looking at the possibility of doing a study abroad program but that did not work out because I already had almost all of my French credits. So then I began to think about taking a trip after my graduation to enjoy France and have an adventure to mark the transition from my studies as an undergraduate to the next phase of my life. When I realized that I would be working on this project so close to the summer, I began to imagine some way to connect my trip and my future work on this project. One of the reasons that I chose to go to Saint-Brieuc and Annecy is because they were two of our potential cities. I am happy that this trip and my work on this project are happening together, and I hope that during my trip, I will be able to further connect the two. This trip is also important to me because it is the biggest thing that I have ever done of my own volition, as far as going outside of my comfort zone, doing something new, and making a dream turn into reality. I have high hopes for this trip as a transformative moment in my life in many ways. Starting college six years ago was a very big moment for me as well and I remember being anxious about it and unsure of myself. I have learned so much over the past six years and I have come a long way. It is my hope that this trip will aid me in attempting to overcome one of my biggest fears, being away from home without my parents. I am nervous about this, but I am also looking forward to the autonomy that this experience will give me. I am excited to be able to use my French skills in real-life situations and to be challenged in this way. This trip represents a shift for me from one stage of my life to the next. Some of the skills that I hope to gain on this trip are : more self-confidence, trust in myself, the ability to be more spontaneous, to become more fluid with my spoken French, and to learn more about how to do things in life that I do not have much or any experience with yet, such as managing money, planning a trip and travelling to another country. I have learned so much already with the planning that I have done for the trip. For example, I made all the reservations on AirBnb with minimal help and I communicated with the hosts entirely in French, which I am really proud of! I have envisioned taking this trip with my brother for a long time, and I am so happy that it is really happening. What did you gain, if anything, from this experience? Although it has only been a couple of months since I started this Capstone, I feel like a lot has happened, even if it does not seem like it. In terms of the focus of the Capstone itself, I feel like I gained more trust in my ability to write and send professional emails to people in French on my own, I got more practice navigating websites in French, which will definitely be useful to me in the future. As far as my trip is concerned, I have learned so much in such a short time! I have learned about Air Bnb and how to use the site, I have gained confidence through communicating with people on there in French. It was challenging because not only was I writing to them in French, but I had to explain what things I will need because I have a physical disability. I had to ask about things such as how many stairs places have, what floors are rooms on. I completely forgot to ask whether there were bathtubs or showers in the different places, so after I had already booked them I had to write to everyone and ask that question. I felt a little silly for not having thought of that before but it was a good learning experience, and it has helped me to think of more things that I might need to be aware of in terms of accessibility. It also helped me to realize that I am/will be doing a lot of new things in this process and so of course I can not know how they are done, and I will probably make mistakes at times and have trouble understanding/figuring things out and that it is okay. I am beginning to look for train tickets now, and that is a whole new world. Doing all of this planning for the trip has helped me with the things that I have done for the class as well. It has made me think more carefully about how I am writing emails, if I am being clear, and how I am presenting our project and our interests. What was the most rewarding part of this process for you? The most rewarding part for me was writing emails in French (both for the project and my trip) and getting responses! It makes me feel as though I have really accomplished something, because I successfully communicated ideas to strangers across the world in my second language! I think the only thing that I would do differently is that I would have written up a slightly more detailed plan of what I was going to do when the term began. This would have been somewhat difficult to do considering the fluid and changing nature of our project. From here, I go to France, a land I have been waiting to see for ages. I hope to continue effecting change while I am in France as well as when I return. I am looking forward to seeing this project transform and I am also hoping to continue to work on it over the summer and into the future. I will be taking a year off before very likely going into grad school at PSU to pursue my Master's Degree in French, and I hope to spend time working on this during my year off. I will add anything relevant to this site that happens during my trip to France! Here is the draft letter that I sent to all the schools in Annecy. I modified it sometimes for the private schools, to mention the progams that they had relevant to language and cultural connections. An English translation is provided after the French version. Here is the draft letter that I wrote to the sister city committee in Annecy.